Note that all good rat cages are metal. No cheapy plastic levels and bottoms. Super stores however would love to sell you the garbage that does. The Martins do have plastic bottoms but they are heavy and cannot be chewed through. They are great cages! Please note that some very old websites tell you that rats levels should be solid and not wire because wire causes bumble foot. This is OLD info! At least 20 - 25 years old! The latest technology in caging will have wire levels. Rats need this to keep their feet clean and healthy. So do not buy into info that says otherwise. Note: If you are getting Dwarf rats, please do not feel you can get a smaller cage for a smaller rat. 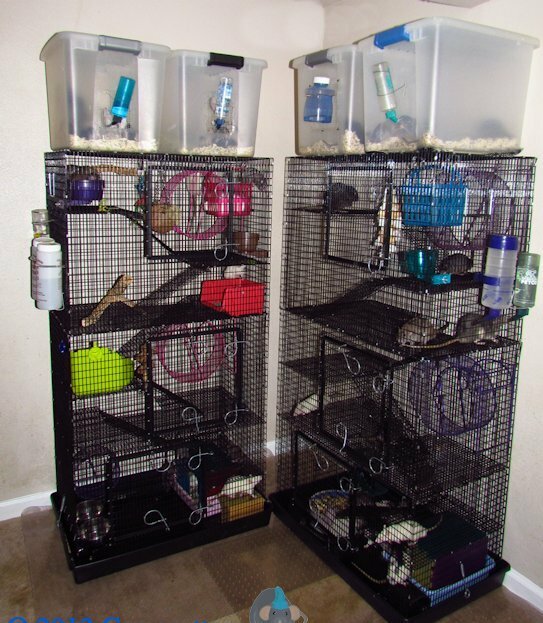 Dwarf rats require larger cages because of their increased energy level. Never buy a smaller cage. They need the same size as standard rats. For recommendations on getting a rat cage please see my rattery page & Martinscages.com If you choose Martins I recommend the "rat lodge" or larger for a pair of rats . If you do 3 rats go one size bigger. 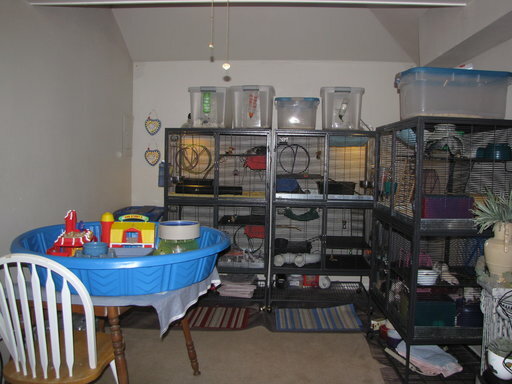 A lot of people get lazy lol and get the pet co rat manor, it is not big enough to house 2 rats. It's just teeny tiny. Also the levels are 1/4" bar spacing and the poop piles up on it causing bumblefoot. So do not buy it. There aren't any good cages at low ball super stores like that. Martins does have cages that are too small for rats to live in. They are better as carriers. So do not buy the 14" cages. Make sure you are getting the larger ones. Also if you are purchasing Dwarf rats that especially applies to them as they have higher energy and need larger cages not smaller cages. 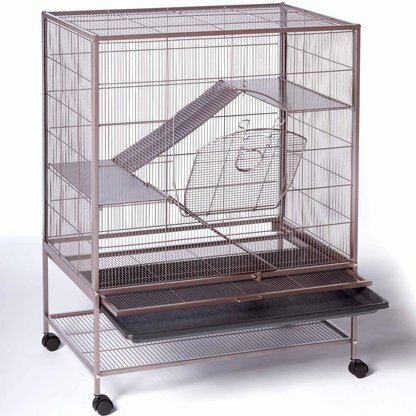 Martins has many cages that you can choose from. Go to Martinscages.com. They have pictures posted there so need for me to repeat that here. If you choose Martins I recommend the "rat lodge" or larger for a pair of rats . If you do 3 rats go one size bigger. They have every cool cage imaginable. There are many cages to choose from. Just pick the ones that have levels and make sure they are 1/2 bar spacing. You can pick many different styles. Solid metal, no cheapy chewable plastic parts. Pull out trays, accessories galore! 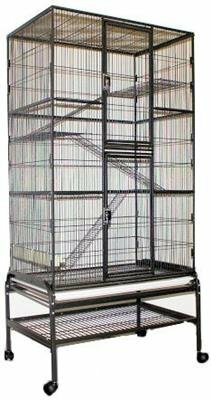 In my desperate search for great rat cages I stumbled on these cages on 1.6.2018, no one has had these in the rat community before. So this is a new cage for us. Its also a new cage on the market for the Exotic Nutrition company where you can purchase it. I ordered 2 of the cage on the right. One or my boys and one for my girls. Another example of a great rat cage from Exotic Nutrition (HQ cage brand). They have more than this to choose from, I am just giving a few examples. Choose what best fits you! This was my rattery in 2009 - 2012. This is the double Critter Nation. I had 3 of them. This is a safe cage, many people like it. But its very heavy. Fed X says 110 lbs in the box. About $239ish. You can find sales on it cheaper sometimes. It also comes in a single unit with one level. It does rust after a while and the legs wobble permanently if rolled on carpet so I prefer he M Cages. The levels are plastic. They last a while but not forever. I have used this cage in the past. 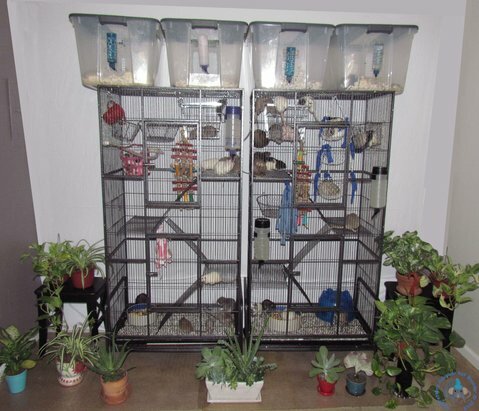 In this picture the boys cage has 27 rats in it, the females has 20. So this is great for a colony of rats. Yes you can "trick it out" with all the cool hammocks and toys you want. Its go so much potential! Just the 1st week after I got mine several sets of people bought them up too! Everyone can see its potential and look forward to its light weight steel design. Fed X says this cage is 30 lbs in the big box its shipped in. Note that the CN cage is 110 lbs according to Fed X! What a difference! 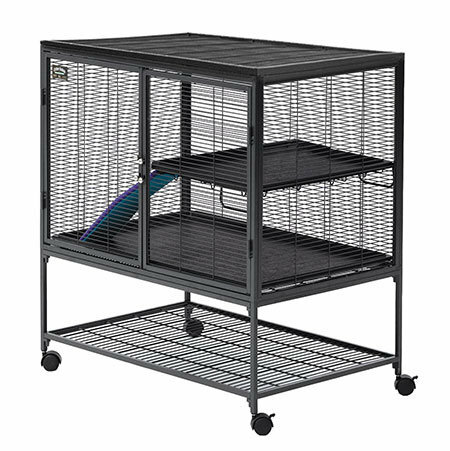 **Please note that this cage has 4 breeder doors on the sides. And you will need to permanently seal those shut with some cage clips from the feed store. Otherwise your rats will let themselves out in minutes of putting them in it. ** Also note that the sellers on ebay change their links to the cage weekly, monthly or whatever is best for their company. So you will have to search for their new adds. They have become harder to find on ebay and Amazon as sellers are listing them under odd names. 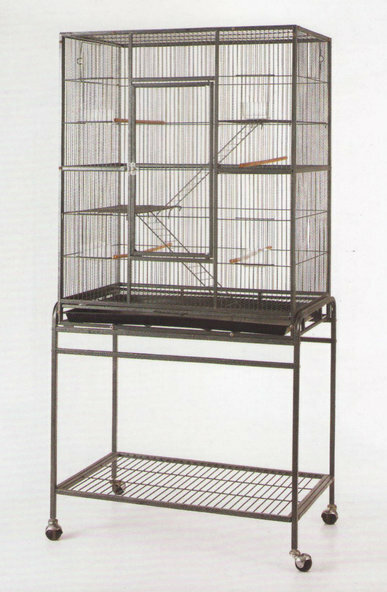 So if you look for this cage on those sites do it by picture not name. 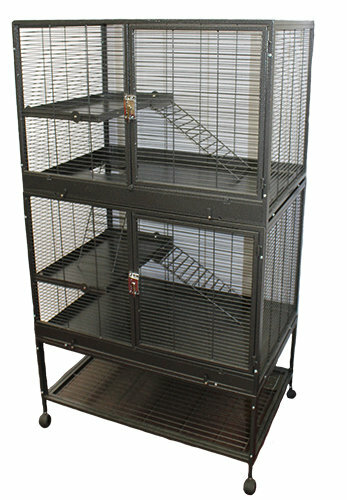 The smaller version of the M Cage larger one above.You can put 5-6 rats in it. 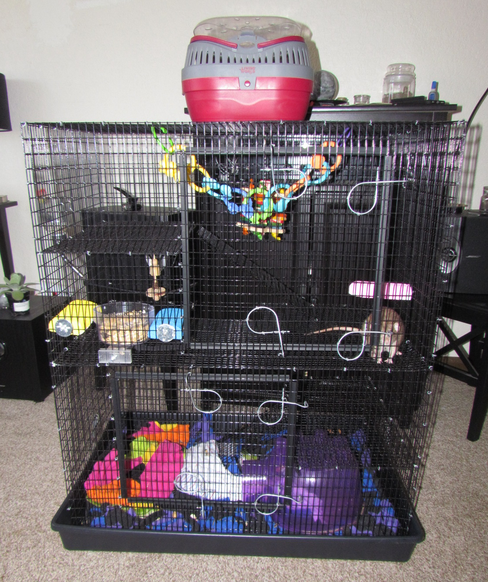 If you do order the cage please send me a picture of it all set up with toys and rats so that I can show it off to give people ideas of how it looks set up. 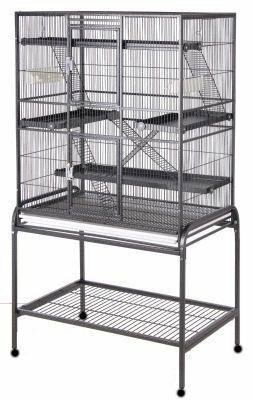 ** Please note that this cage has the little feeder doors on the front, and 2 breeder doors on the side. And you will need to permanently seal those shut with some cage clips from the feed store. Otherwise your rats will let themselves out in minutes of putting them in it. ** Also note that the sellers on ebay change their links to the cage weekly, monthly or whatever is best for their company. So you will have to search for their new adds. I wont have the link. Look for the cage picture on ebay or amazon they list them incorrectly by name. Great cage. $179 from Drsfostersmith.com. I have one as a back up baby grow out. That in conjunction with 2 custom Martins cages is what I keep my 4 + week old babies in. I love that it has metal shelves not chewable plastic ones. I also love he grate on the bottom so the rats cant get to the bedding and make a huge mess. Although their tails still get under there and fling a few pieces out.